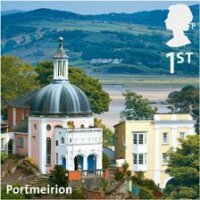 Fans of both philately and Portmeirion may be interested to hear that Portmeirion features on the new range of stamps from Royal Mail, issued on 10th April 2012. The range is alphabetical of 26 stamps and the Village will represent the letter 'P' in the collection, which takes in iconic landmarks. Also featured are the White Cliffs of Dover, Station X: Bletchley Park (see events page for a summer visit to the location) and other locations. With thanks to Leslie Glen and Jill Mills for this news item.